Drywall is also known by several other terms, such as wallboard, plasterboard, particle board, and gypsum board. Regardless of the different technical word, the function of drywall is still the same; it is installed to cover wall or partitions in every room at home. Introduced in the 1950s, drywall is now used as a standard wall covering in the United States. 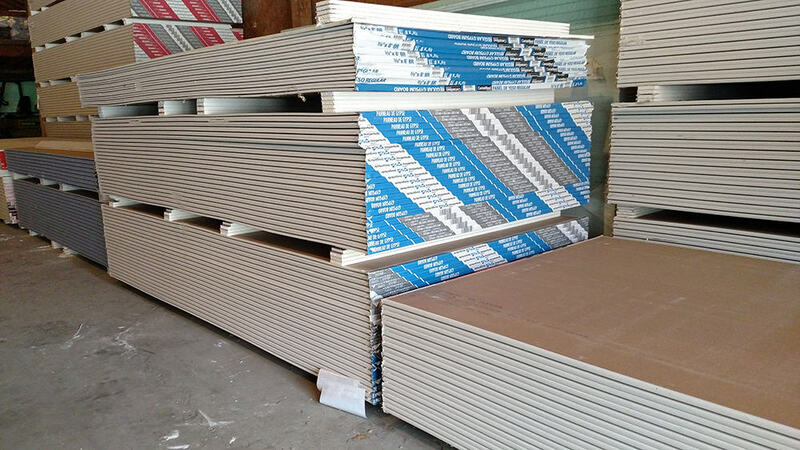 You can find many different types of drywall available in the market for various installations in the home project. First, let’s get to know the main characteristics of each type. Regular drywall is the most common type of wall covering that can be easily found in traditional homes. This drywall sizes usually range from 8 to 10 feet long and 3/8 to 1 inch thick, while the width is 48 inches. However, there are some types of larger regular drywall in which the length can reach up to 16 feet. Because of its various sizes, regular drywall can be used for almost every room in your house. Blue drywall is mostly used for veneer plastering. In addition to having high-quality absorption system, this drywall is resistant to water and molds. For this reason, it becomes one of the most popular choices for the bathroom wall. You can also install the blue board in several other rooms which have high moisture. Because this type of drywall is made of cement, it is highly durable as well as resistant to water. The content of cement strengthens the wall with fiber, resulting in rigid and hardy features. Cement board also makes a firm base for ceramic tiles so that you can use it in the starting construction of a bathroom or shower stall. As the name infers, green drywall is covered by green layer. This type of drywall is resistant to moisture, but it isn’t necessarily categorized as a waterproof wall. Frequent direct contact with water may damage the wall and discolor its layer. Regarding price, the green board has a higher cost than the regular drywall. However, it can be a good choice for bathroom drywall, as well as to cover the walls in the kitchen and laundry room. Paperless drywall is formed by combining fiberglass and gypsum. Because of this, the drywall gets the best quality of both materials. Fiberglass content makes the wall highly resistant to water, while gypsum strengthens the wall’s durability. Also, paperless is identified as mildew and mold resistant drywall that can be installed in the areas with high humidity or moisture level. Purple drywall is an excellent choice for rooms with high moisture. Additionally, it is proven as waterproof drywall, so you don’t need to worry when the wall is frequently in contact with water. Similar to the blue and green board, this drywall is also mold resistant. Due to its quality, purple drywall can be installed in either the wall or the ceiling. From the name alone, you can conclude that it is a type of drywall for the basement. This drywall has a core, face, and back paper which are designed as resistance to mold and moisture. For this reason, the wall can be safely installed in the rooms or areas below the level of the ground. Basement drywall is also less expensive compared to other types of moisture-resistant walls, such as a purple, blue, or green board. Soundproof drywall is formed by combining laminated drywall with several layers of gypsum and materials. These include metal, plastic, glue, ceramic, and polymers. The combination of these materials makes the wall dense and stiff, so it can reduce vibration as well as disallow any sound to go through. In line with its main function, soundproof drywall is used in areas which do not allow too much noise. Music room, meeting room, and family room are some areas that usually apply this type of drywall. Type X drywall is highly resistant to heat and fire. Its main material is gypsum core, but the wall is also strengthened by special types of glass fibers with noncombustible content. In general, the thickness of Type X is 5/8 thick, but you can combine several layers to make a thicker soundproof wall. With 20 minutes to one-hour fire rating, Type X is usually used in garages and apartment buildings. Another type of fire-resistant wall is Type C drywall. Similar to Type X, it also consists of gypsum and glass fiber. However, Type C has a higher content of glass fibers. The gypsum used in Type C is also contained hydrous silicate minerals. As a result, the wall can compensate shrinkage caused by fire. Having 2-4 hours of fire rating, this drywall thickness usually ranges from 1/2 to 5/8 thick. EcoRock is an eco-friendly type of drywall. It is made by composing several kinds of recycled byproducts from an industrial process, including slag, fly ash, and kiln dust. Those byproducts are mixed with water and filler to create a pourable paste. In addition to its safe materials, EcoRock is resistant to several types of insects and bacteria, including mold, mildew, and termites. Besides EcoRock, Enviroboard is also a great alternative if you want to install eco-friendly drywall at home. This drywall is commonly formed by waste fibers from newspapers or agriculture process. Because of this, the main materials of Enviroboard are clinically and ecologically safe for both humans and pets. After you know some basic information about different types of drywall, you can proceed to take the next steps in your home project. These include measuring what size drywall for walls¸ preparing other materials for installation, and at last, installing the drywall in the rooms. Therefore, it is important to choose the best type of drywall, so you can get the best result once the wall has been installed.